A rapidly intensifying brush fire blazing 5,000 acres in the Los Angeles area Saturday forced hundreds of evacuations — just as firefighters contend with record high temperatures scorching across the state. At a morning news conference, Los Angeles Mayor Eric Garcetti said the city has never witnessed an inferno of this magnitude in terms of acres, calling it the "largest fire in the history of Los Angeles," and that it had been 45 years since one has occurred in the area, allowing for "plenty of fuel to burn." Update on #LaTunaFire from Mayor @EricGarcetti & @LAFDChief Terrazas. Garcetti said the city dispatched several response efforts, including 500 firefighters from numerous departments, who were able to contain 10 percent of the inferno, but added that the blaze — known as the La Tuna Fire — is still not yet confined. "We have firefighters confining this as it grows," he said, "but conditions are dangerous." 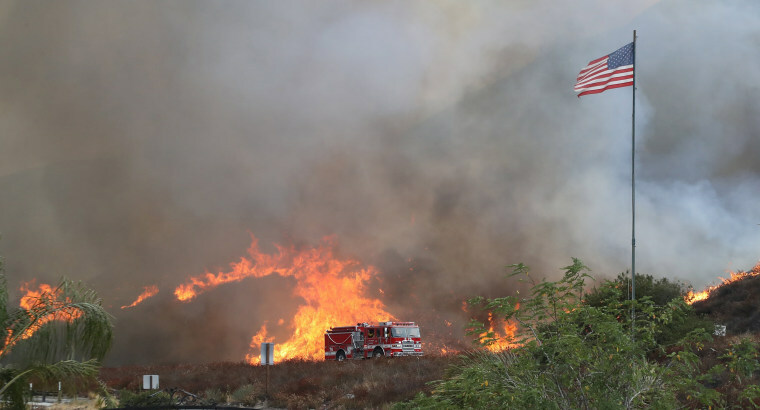 The fire began Friday near the La Tuna Canyon close to the 210 Freeway, north of Los Angeles. It enveloped thousands of acres in a matter of hours, causing not only the highway to be shut down in both directions, but hundreds of immediate evacuations. Officials ordered mandatory and voluntary evacuations for 300 homes in Burbank, 180 in Los Angeles and 250 in Glendale — with several other communities bracing for the same, the mayor said. So far, no injuries were reported, which is a huge blessing, said Los Angles Fire Chief Ralph Terrazas. But three structures, including two homes that did not have brush clearance, had been destroyed, he said. While the official number still stands at 5,000 acres, Terrazas said he had "confidence" that the area ravaged by the fire is much larger than that. "We just haven't had time to fly the perimeter with our helicopters," he said. Exacerbating relief efforts have been searingly hot temperatures and dangerous wind conditions that have blanketed the state for several days. California residents were under an extreme heat warning through the weekend with temperatures hitting almost triple digits, according to the National Weather Service. A typically mild-weathered San Francisco hit a sizzling record high of 106 degrees on Friday and Los Angeles checked in at 100 degrees as of Saturday morning. "Very hot and unstable conditions" are adding to the "extreme fire behavior," the NWS tweeted. "Our biggest concern is wind and weather, the erratic weather is our No. 1 challenge," Terrazas said. "Winds have changed direction multiple times, causing the fire to spread in every direction," he added. Volatile winds helped disperse flames through the Verdugo Mountains, located in Los Angeles County, into surrounding areas. The fire would be much easier to attack if the weather was not so "unpredictable," Terrazas said. Law enforcement was assuring individuals who are leery of evacuating that police would remain in the area to protect and secure their homes. "We have sufficient resources to make sure safety is first and foremost," said Los Angeles police Cmdr. Jorge Rodriguez, adding, "We are here to make sure their property is safe if they evacuate." Officials were also urging residents to clear brush from their homes to make it easier for firefighters to fight flames that continue to spread. "Our priority is saving people and saving property," Terrazas said. "Give us a chance to save your house."